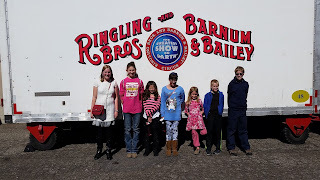 We bumped into the Brimberry's at the Circus. That was a fun treat! This is probably the last time we will attend this event. With all the animal rights activists, it seems that they have had their way. There were very few animals doing tricks. In fact, most were farm animals, instead of exotic animals. The motorbikes, tight rope walkers, and trapeze artists were entertaining, but it doesn't compare to what the circus used to be. I guess we'll stick with Disney on Ice.